American Conservatory Theater's Master of Fine Arts class offers a fresh take on one of Shakespeare's most beloved comedies. The title of Shakespeare’s popular comedy “As You Like It,” practically begs you to well, like it. And it’s hard not to appreciate a play that’s as frivolous and fun as Shakespeare’s manic masterpiece. There’s cross-dressing, whimsical songs, puns, poetry and wrestling. It has everything a theater-goer could love, plus there’s mention of deer-meat. The American Conservatory Theater’s latest production manages to exude all of the exuberance that made this play a classic while maintaining a fresh and playful perspective. Playing at the Zeum Theater, located adjacent to San Francisco’s Children’s Museum, the location already lends this production a youthful flair. In addition, this is A.C.T.’s latest showcase for its Masters of Fine Arts class of 2011, a group of refreshing faces befitting a play already filled with the follies of the young. After her father, Duke Senior, is banished by his younger brother (Duke Frederick), rosy-cheeked Rosalind and her cousin Celia flee to the magical Forest of Arden where love, music and gender lines merge. Rosalind has fallen for the winsome Orlando, but she’s disguised herself as the pageboy Ganymede. All the while, mistaken identities flourish as romantic entanglements ensue. It’s a complex plot, but one that is made easily accessible in this production. When Rosalind first encounters the dashing Orlando, he is set to wrestle a minion of Duke Frederick. Only, instead of Elizabethan neck ruffles and fisticuffs, we get a tattooed vagrant in a Mexican wrestler’s mask. It’s slight off-putting at first, but director Mark Rucker’s production can have that effect. Instead of the traditional route, he’s gone rogue and the result is an exciting new spin. Rosalind dons a a Victorian dress in once scene while her father does his best Davy Crockett impression (fringed coat and all) in the next. There’s a definitive sense of anarchy in the costume decisions, but even though it’s initially unsettling, the oddball ruffles of Rosalind or the feather headdresses make sense in a play all about rule-breaking. This may be why the first act feels stilted and slightly stale. The beginning of “As You Like It” is set entirely within the grim court of Duke Frederick. He’s usurped the crown so the feeling is bound to be a little tense. But it doesn’t help that the actors overly-enunciate their dialogue and the staged fights feel stodgy. However, once the curtain falls and we, like Rosalind and Celia, flee from the icy confines of the court, the Forest of Arden welcomes us with warmth, joy and a lively lawlessness. Instead of the dour, minimalist set of the first act, we get a knitted wonderland where trees are fashioned like quilts out of patch-work fabrics. And in lieu of stony facades, the actors freely dance about the stage, revel in delightful musical interludes and dabble in masterful games of wit. 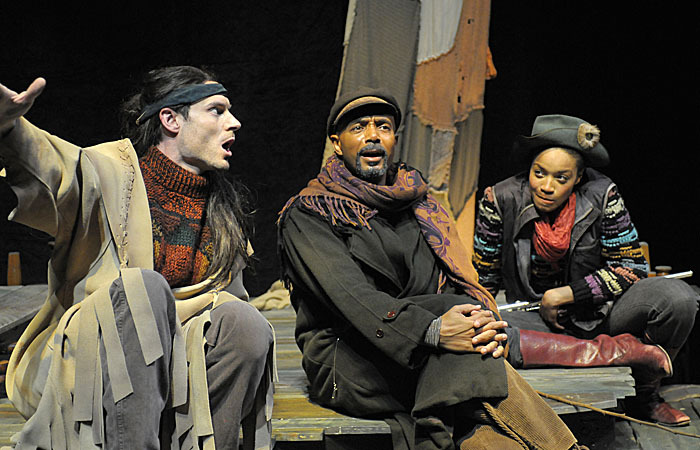 It’s in the relaxed and liberating atmosphere of Arden where A.C.T’s “As You Like It” truly shines. Max Rosenak (Orlando) and Ashley Wickett (Rosalind/Ganymede) have a fiery chemistry in addition to an already colorful set of characters including a sarcastic Touchstone the clown and the melancholic, but wise Jacques. Played by A.C.T’s seasoned, core members Anthony Fusco (Touchstone) and Gregory Wallace (Jacques), their impeccable timing and amusing asides occasionally outshine the others. But instead of diminishing the other cast member’s talent, their inclusion only enhances an already sterling ensemble. Funny, touching and wildly creative, A.C.T.’s production of “As You Like It” lives up to its name and then some. Jessica is the assistant arts and entertainment editor.